The 18-year-old Forest Grove City Council candidate was suspended for his 'Build a Wall' banner at school in 2016. Solomon Clapshaw is not your typical student. 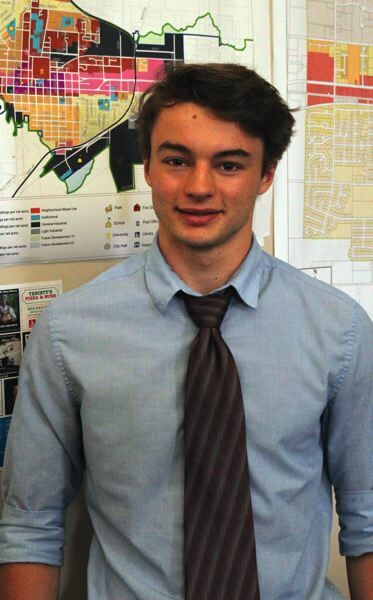 At just 18 years old, the high school senior is running for Forest Grove City Council, campaigning after class and on weekends on a platform that calls for more young people to get involved in local issues. He wants the city to focus on building more housing. He wants to spark conversations among residents about the best way to move forward amid a booming economy and low unemployment. But there is one issue Clapshaw has struggled to personally come to terms with. The walkout at Forest Grove High School two years ago not only left a mark on the city, but Clapshaw as well. Clapshaw was one of two students who hung a banner reading "Build a Wall" at Forest Grove High School in 2016. The banner, which was hung from a walkway above the school's cafeteria, sparked a massive student walkout at FGHS, where nearly half the student body is Latino. 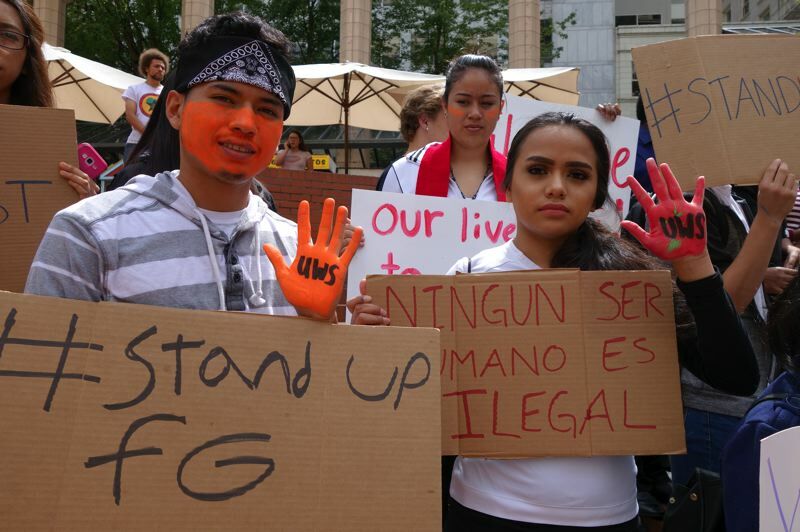 Hundreds of Forest Grove students marched out of class in a protest later dubbed #StandUpFG. 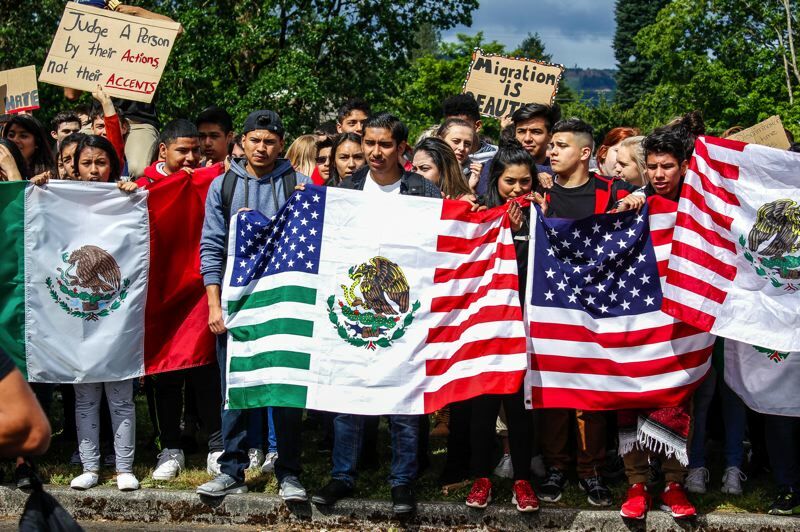 That walkout, in turn, led to nearly 20 similar, supportive walkouts across Washington County and beyond, from Hillsboro to Tualatin to McMinnville. The walkouts received national attention. Members of Congress posted words of support to protestors online. Clapshaw hasn't talked publicly about his involvement in the incident until now, but he's not hiding it, he said. He sat down with the News-Times on Tuesday to talk on the record about the incident for the first time. "I was an idiot. That's the simple answer," Clapshaw told the News-Times. "I was an idiot, and I was really bored. I wanted to see what would happen. I wanted to spark a conversation, but it didn't do anywhere near what I thought it would." The aftermath of the walkouts is something he's had to learn to live with, said Clapshaw, who characterized the banner as a misguided attempt to get students involved in local politics and said its "Build a Wall" message is something he has never personally believed in, even at the time. He and the other student who hung the banner were simply looking for a statement that would be provocative, he said. "If people had something to rally against, I thought maybe there would be discussion," he said. "I had no idea of the symbol that (message) really represented and how hateful it was. Of course, people were very upset." The walkouts did bring people together, Clapshaw acknowledged — but it also divided his community. "There is a stark difference between conversation and argument," he said. "A lot of what was going on were people yelling at each other and crying and being sad. That's not what I wanted to happen, in any way shape or form." The banner was hung at a tumultuous time. Two months earlier, a black teacher at FGHS was called a racial slur by students. She sued the school for discrimination and later resigned. The school year was one marked by issues of inclusion and racial tensions. In response, the district launched programs and curricula aimed at addressing issues involving race and discrimination. Clapshaw — who was 15 at the time the banner was hung — was suspended from school for three days. He wrote a public apology letter, which was printed in this newspaper. At the time, the News-Times did not name Clapshaw as the student responsible for the banner. Now, two years after the protests, Clapshaw said he has grown as a person and learned from his mistakes. He has focused his time on bettering his community, he said. Clapshaw currently serves as a student advisor to the Forest Grove Community Forestry Commission. He spends time volunteering at the Forest Grove Farmers Market, has worked to register his fellow high school students to vote, and has given numerous presentations at the high school and Neil Armstrong Middle School to promote civic involvement. Clapshaw said the lessons he learned from that experience have shaped him as a person. "It's not something I am proud of, but I acknowledge it," he said. "I figured out there are other ways to get people involved than being really mean." But the walkouts remain a regular talking point in the community. U.S. Rep. Suzanne Bonamici brought up the walkouts at a community meeting earlier this week. "It comes up probably every other day," Clapshaw said. "There was a teacher who was really upset with me just last week about it. He even called me a jackass. But since then, I've gotten to know him a little bit better, and he gets along with me just fine." As one of five candidates currently running for three open seats on the Forest Grove City Council, Clapshaw hopes voters can forgive the incident, if not forget it. "People who know me know that I am a fairly reasonable person, at least now," Clapshaw said. "People change." Clapshaw said he hopes the mistakes he made as a 15-year-old won't keep him from serving in public office. "The one thing that was good that came out of that is (learning) that your words have consequences," Clapshaw said. "It's a shame that it took thousands of people (marching and protesting) to learn that. … It's good to take a step back and think about things before you do something. I definitely needed to learn that more than most people." Clapshaw said his campaign is about giving people a voice. That's something he hoped the banner would bring. Now, he's trying a different tactic. "I just wanted to have a conversation," Clapshaw said. "That's all I've ever wanted."